A solo flute recitation programme by Ustad Azizul Islam was held at the Kobi Sufia Kamal auditorium of Bangladesh National Museum in the capital today at 10:30am. Organised by monthly Sargam, the only regular magazine on music in the country, noted artist Hasem Khan was present on the occasion as chief guest. Ustad Azizul Islam, a leading flute player of the country. His first Guru (preceptor) in music was late Priyada Ranjan Sen Guopta of Arya Sangeet Samity, Chittagong. He was awarded Ekushey Padak by the Government of Bangladesh in the music category in 2017. Ustad Azizul Islam studied in Government Muslim High School Chittagong and Chittagong College. He then graduated from Bangladesh Marine Academy. He became a captain of a merchant vessel. He was trained under Ranjan Sengupta and Vilayat Ali Khan. Islam left the marine job in 1973. He became a student of the Indian sarod player Ustad Bahadur Khan to acquire the knowledge of the performing style of Seni Gharana. Then he received lessons from the flutists Devendra Murdeshwar and VG Karnad, both disciples of Pannalal Ghosh. 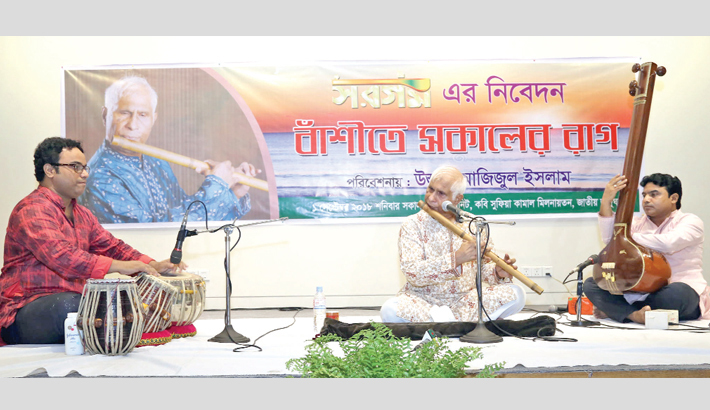 Ustad Azizul Islam’s flute performances were held in a wide number of places in Bangladesh, India, Europe and Australia. His solo flute recital programs were organised in Kolkata by Sangeet Research Academy, Saptasur, Salt Lake Music Festival and in the Habitat Centre of Delhi as the first one by a Bangladeshi artiste. Ustad Islam had the rare privilege to perform ‘Jugal Bandi’ with the great Violin Maestro Pandit VG Jog (Padma Bhusan) in Kolkata and also in Dhaka, which were highly appreciated by house full of audience. He was awarded Gold Medal and Crest jointly by Rotary Club of Metropolitan Dhaka and Ashfaque-Najma Foundation for his contribution in the music sphere.